The Air Force has just released their newest dress code – Dress and Personal Appearance of Air Force Personnel (www.af.mil/shared/media/epubs/afi36-2903.pdf) after much debate on the clarification of Tattoos Policies. Based on these calculations outlined below, Air Force members can check if their body art passes the test prior to applying. 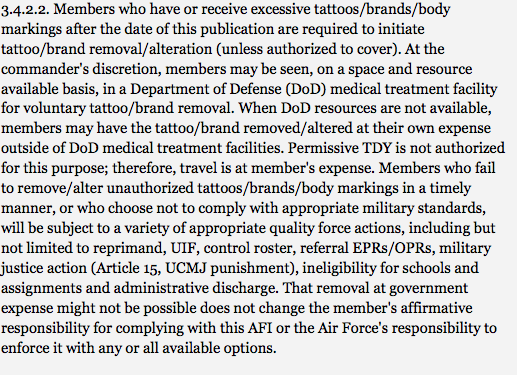 For those who don’t, or are already enlisted, the Air Force is requiring Members to initiate tattoo cover up solutions. Based on the calculations would you pass the test?